Blog - Christmas Sales 2015 Australia at DownloadMSOffice.com! Christmas Sales 2015 Australia at DownloadMSOffice.com! Over 70 products (and counting) are available for our Christmas sales 2015 Australia at DownloadMSOffice.com! All products displayed on the site are eligible for the promo. 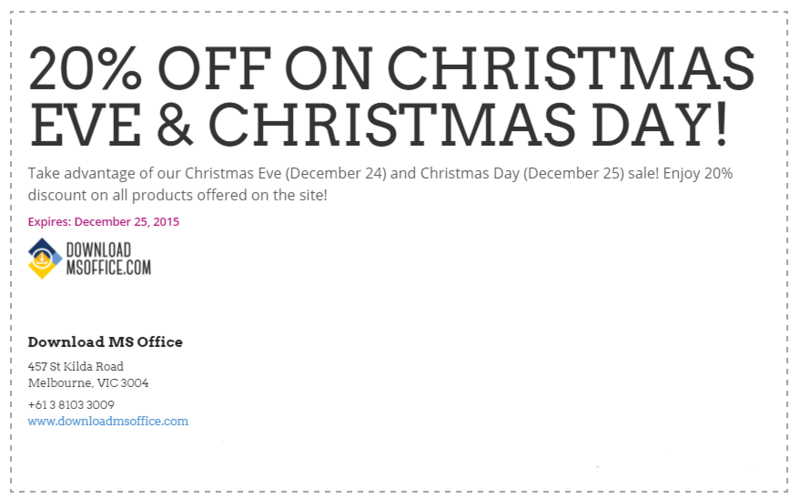 Save 20% on any items purchased on Christmas Eve (December 24) and Christmas Day (December 25) only. No coupons to cut or print and no codes to write. And when we say all products, we mean ALL PRODUCTS!!! So if you haven’t wrapped a gift for friends, love ones, and colleagues at work for the holidays yet, it’s never too late! You can even purchase a gift for yourself! Just join our event for Christmas and save 20% more on already affordable products! Don’t get stuck in traffic while driving or commuting. Avoid rummaging through disarrayed products previously disorganised by an enormous number of people who even camp out while waiting for brick and mortar store sales. You can shop from any device connected through the Internet (desktop, laptop, tablet, smart phone). Just type www.downloadmsoffice.com on your browser and browse through our growing number of products. Choose one or more (the more, the merrier!) and follow the easy checkout process. Once your product key is sent via email, you can forward it to the recipient. No need for gift wrappers and the effort to wrap it. Our range of products include Windows operating systems (Windows 7, 8, 8.1, 10, Server), Microsoft Office (2010, 2011 for Mac, 2013, 365, and 2016), MS Office apps (Publisher, Access, Outlook, Visio, and Project), and antivirus programs from popular brand names like Norton, McAfee, Bitdefender, Kaspersky, Avast, and more to come! Mark your calendar for our Christmas sales 2015 Australia event now!